Choosing a career out of any stream of education is a decision where a person needs to be aware of his/her future requirements. There are lots and lots of options to choose after completing education, but making the right decision is something very essential. Most of the people get confused at the end of their education. One of the most confused state of choosing the right option is after their engineering. 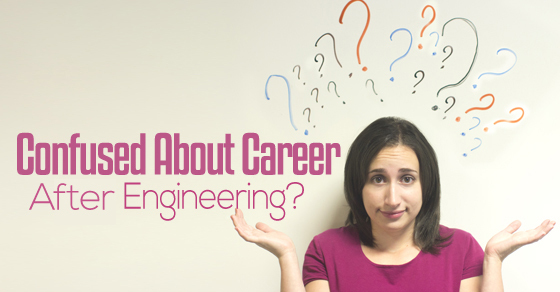 So, enlisted here are few choices for people who are thinking about a career after engineering. Engineering is one of the brightest and evergreen profession which has a great demand. Every year lot of students try hard to crack the entrance exams and select the engineering stream which they have an interest in. Even most of the elders prefer their children to become engineers. Though many do not know a lot about this engineering stream, there are few myths that are common regarding engineering. Management degree along with engineering is a great compilation. R&D engineering is best done by foreign MNCs. Choosing a career is a very important step and should be taken carefully. Many students encounter such situation right after their graduation, so a proper and right decision will help get successful in life. The two common options open before you will be money or interests. The choice is left on the individual whether to chose money or work that interests you. Well as a piece of advice, I would recommend you to choose the career related to your studies, passion, interests etc. Now if you too are in such a chaotic situation then follow the steps provided below. There are many career options for engineer graduates. One of the major decision that one is supposed to take after completing their engineering education is that which kind of career options one should choose. To make that decision easy, there are several types of tips and solutions which can help one to make their decision easier after their engineering studies. After completing engineering studies, a person might think about his / her future. And to have a secured future, a person needs to make the right decision of choosing a perfect career option for themselves. Most of the candidates prefer enrolling their names in some of the career resource centres, which helps them find their dream job or which lead them towards a better career and future. Similarly, these career resource centres help their candidates to choose a better option for their own career. While studying engineering from the well-reputed institution, a person might be approached by several companies and that may be because of campus interviews or placements. These campus interviews help all the candidates from different colleges to make their career options clear. Most of the time campus interviews are held to profile all the eligible candidates who can be an asset for the company. Most of the people who finished their studies may get caught in the confusion that whether to continue their education or whether to continue working in a company. But in this growing economy, getting a decent job is difficult because of growing competitions between people. Therefore, most of the students continue their education, such as continuing studies with M.tech and many more. So that the possibility of shortlisting for the job will be a feasible option for a better and successful career. Nowadays, most of the engineers are interested in covering their educational qualification by joining the MBA. Joining the master’s degree course and that also from the different stream of education would provide an overall feature to one’s educational requirements. This masters degree in business administration provides an overall feature for the engineers to overcome their economical imbalance when it comes to the process of recruitment. Most of the company prefer their employees to be an engineer who holds an MBA masters degree as well. Every college and educational institution have their own professional career counsellor who helps all the students with their career options. Such a career counsellor creates an environment which helps those needy students who are really confused about their future. If a person is confused about the decision which can lead them to protect their future then they should try communicating with those career counselors for better solutions. Most of the students and people who are confused about their future may seek professional help for their career confusion. These professional tries to explain all the possibilities of engineering studies and their scopes as well. If a person completed his / her engineering degree, then the possibility of the person getting a job may be positive, but if they chose to continue their education, then the possibility of earning a better salaried job is very much positive. The internship provides an environment where a candidate might get oneself be exposed to a different level of educational and professional outlook. Joining reputed companies for an internship provides the candidate an extra value of an advantage for the candidates. Once the person completed his / her engineering then it would be best to start an internship in some company which can give them a better overall professional advantage during one’s actual job interview. Applying for an internship and voluntarily joining a company for the educational purpose is like two different things. If an engineering student decides to join a company voluntarily, then the whole purpose of the joining would be considered the voluntary decision. Most of the time interns are treated the same as the employees of the company, even when it comes to salary or wages. But a candidate who voluntarily participated in the company may not be treated the same. Most of the engineers who finished their engineering think only about the company where they can get settled for the rest of their personal and professional life. But the completion of engineering creates such level of confusion that a person might get stuck with their career option. One of the best career options that engineer student could definitely think of joining can be civil services. These civil services deliver overall safety and security for all the engineering candidates, it would be best if an engineer student decides to prepare for the civil services after the completion of engineering. After completing engineering, if a person decides to improve his / her credibility, then it is good if he/she decides to join some short term courses. These short term courses provide professional knowledge about the engineering stream, moreover, it provides professional work experience for all their enrolled candidates. Therefore, these short term courses can maintain the activities of engineering without any external effects. It is advisable for most of the engineering students that after completing their engineering they can choose to go abroad so that they can pursue a better education. Engineering provides overall features that can be beneficial for a career oriented person or a student through their career options. And studying abroad can benefit in a large manner. However, if someone is confused about their future after their engineering then it would be best for them to go abroad so that they can design their own life. If a person who completed their engineering didn’t receive the level approach from his / her dream company where they wanted to work and build their career. Then it would be best for those people if they start their own small business. Because sometimes getting any job just for the sake of earning money might screw up things in one’s life. It would be better for those engineers to start their own career, which can satisfy them in all manner. After completing engineering studies, it is common for a person to feel confused, but instead of encouraging such kind of feeling, it would be better if a person starts encouraging himself / herself to do better things with their life. And after all that, if a person decides to do something about his / her own, then he / she must start building their network through which they can start their venture without any issues. Hence, things may settle eventually and the person who completed engineering might get satisfaction with their professional and personal growth. If a person who completed engineering is confused about his / her future and want to do something with their life, then the person can definitely think about joining the army. Joining the army in the sense of joining other streams of the army and they are navy and air force. Not just in the war field, a person can get himself or herself enrolled in the technical staff section. For those who completed their engineering, they must be receiving an added advantage in this selection process of recruitment. Most of the time after completion of engineering, a person might be able to get a job as effectively as it seems. And instead of wasting time and their educational skills, they can take up classes which can help other students who are pursuing engineering. Being a tutor can be an additional income which can help brush up their educational skills of engineering. And by sharing one’s knowledge, a person can help others to learn engineering easily. Nowadays, after completing engineering getting a job is a bit frustrating for all the students. Most of the time all the people who completed their engineering, only focus on getting themselves involved in some of the well reputed company. They don’t consider their knowledge can be helpful in other streams of a professional career. One of the growing professional career must be educational institutions. A person who has completed his / her engineering with flying colors can think about joining educational institutions which can be feasible for them to grow in their professional life. Studying engineering can trigger some of the creative ideas into a person’s life. And those creative ideas can encourage their hobbies to make way for their career aspirations. It is not necessary that if a person did his / her education in engineering then they are supposed to follow the same pathway of their education. Instead of that if a person has some of the hobbies that he / she is passionate about then they can try following their hobby in a passionate way. The best thing to choose after completing the engineering in computer science is to go for a higher education like doing masters. There are many opportunities in the market for engineering graduates but having a master’s degree would double your chances of getting selected by top companies. After successfully completing your engineering in electronics and communication , there are 2 main option you can do. If you want to take up a job, then sharpen your skills by doing few courses and prepare for competitive exams. There are many government firms which recruit engineering graduates(without experience). There are also many private firms which look for engineering graduates. So if you can clear their written exam and interview then you can get hired with good package and other perks. If interested to study more , then do a master degree in your respective field. You can either opt for MBA or M.S based on your interest. Studying engineering is not as easy as people think nor any other streams of engineering. Therefore, to learn engineering in a healthy and in a better manner, a person need to have fun with subjects. Try to involve creative and fun activities while studying engineering subjects. Whenever a student finds anything tough while studying engineering then he / she should seek others help to solve their issues. Most of the time, it happens that a person studying engineering might turn himself or herself into a book worm who never understood outside elements which was outside of their syllabus. If an engineering students encourages his / her creativity then it is possible that he / she can take time out of their busy schedule. In other words, if a person indulges some creative efforts while studying engineering then it is possible that he / she may concentrate better on studies. While studying engineering, a student need to keep in mind that it would be convenient for them to complete their course of engineering with a better researched knowledge. Studying by the syllabus can limit one’s knowledge to only one dimension. This one dimensional educational can let one limit his / her opportunities for a limited period of time, which is not good for the person. Therefore, it would be better if a student researches more about the relevant subjects of engineering while studying engineering. It is important that a person who is studying engineering need to plan their career improvements. And take the necessary steps to develop their overall features of studying engineering. Planning career improvement could help a person follow a pathway of success which can let them be a successful engineer in their life. The bottom line is that studying engineering takes intelligence and dedication towards the educational elements. And if a person is determined to achieve both then they can work wonders in their engineering streams. Most of the people may get stuck after completing their engineering studies, but instead of worrying about future and career, one can read all the given details to plan their professional and personal growth after completing their engineering. Previous articleWork Experience & MBA Program: Does it Matter?